I adapted this strawberry jammin’ recipe from my Food52 buddy, Liz Larkin, who posted a version of this recipe for strawberry jam during the Food52 strawberry contest. I bought my strawberries from a reliable vendor at the Coronado Farmers Market. Meyer lemons came from our tree, loaded with fruit. I prefer the caramel taste of organic cane sugar. found at either Trader Joe’s or Whole Foods, instead of white sugar. 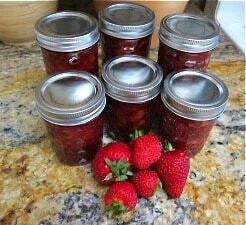 Finally, I finished off the jam with a splash of Grand Marnier. I had great coaching from a terrific food-blogging pal, Wendy, of www.sunchowdersemporia.com , who makes incredible jams and preserves as a profession. Check out her site to see the treasures she offers. For a review of safe canning procedures, I’ll refer my readers to the folks at Ball canning at www.freshpreserving.com. 1. Prepare the berries and thoroughly mix in the other ingredients. Allow to macerate overnight in the fridge. 2. The next morning, drain and save the juices. Set berries aside. Pour the juices into a large saucepan and, using a candy thermometer, heat until 221 degrees, stirring occasionally. 3. Add the berries and heat again to 221 degrees. Cook for ten minutes more. 4. Remove from heat. Skim off the foam or else stir it into the jam. Add the Grand Marnier and stir. Store in sterilized jars, according to proper canning procedures.